I've been reading a lot here lately, which is totally out of character for me. Yes, this high school valedictorian and two time college honor graduate has never been much of a reader. How I made it through all that without reading much, I'm not quite sure. But my new-found love for reading is more than just something to pass the time, to entertain me, or resources for the counseling ministry. I'm actually learning and enjoying it! I'm currently reading Feminine Appeal by Carolyn Mahaney and re-reading Crazy Love by Francis Chan. In Feminine Appeal it was talking about how we often fulfill our duties as wife and mom, but fail to actually enjoy our spouse and children. In Crazy Love, he was talking about how we fail to acknowlege how fleeting this life is. I must admit, these two scenarios have often been the case with me. I would delight in marking things off my to-do list and feel as if I had accomplished something at the end of the day if the house was remotely in order, the dishes were done, and there weren't still mounds of laundry piled up. Yet also at days end, I'd often feel like I had missed the whole point. This feeling isn't something new to me. I've spent the majority of my life just living life, making it day to day. Even on vacations, while refreshed, I'd come home and feel like I hadn't really lived or enjoyed my time away. I have this habit of consuming my trips with taking pictures. Whether it's a trip to the zoo, the park, a concert, a vacation, a friend's house, etc. I take pictures. I recently realized that I was so consumed in ensuring that I had something tangible to remember the events by that I was missing out on actually living and being in the event and having those memories to remember it by. Today has been absolutely beautiful. After playing outside with the kids this morning, I decided it was a back yard picnic kind of day. I got everything ready and out we went. I was incredibly tempted to take the camera but decided that I would just live in the moment and enjoy my time with them instead of taking pictures to commemorate every little thing. We ate our lunches - peanut butter and jelly sandwiches (ham and cheese for me), doritos, pickles, carrots, and grapes. The wind was softly blowing and the sun was beaming down just enough to warm my skin without making me hot. It was perfect. After lunch, the kids were playing on their fort swing set. I was relaxing in the camo chair enjoying the warmth of the sun, feeling myself close to dozing off. Anna came over and asked to sit in my lap. I sat there, rocking her back and forth like she was 4 months old instead of 4 yrs old. And she too basked in being held in the sunshine and cool breeze. 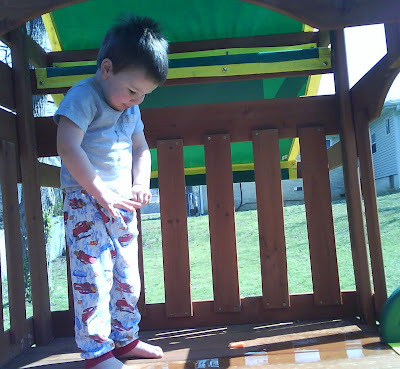 Eli was running laps around the swing set, climbing, sliding, swinging. I once again was close to dozing off when I heard a dripping sound. I opened my eyes to see 'water' coming through the cracks of the fort when I realized it wasn't water at all! Eli decided he'd just choose the most opportune place to pee and the fort was it! I said "Eli!! What are you doing!!?!?" then died laughing. His little feet stood there with drops of urine splattered all over them and my mind immediately went to basking in the moment and the fact that I had left my camera inside. But oh how wonderful it was that I had my cell phone on me and was able to snap a few pictures of something so completely out of character for him (believe it or not, he's never done anything like this). Instead of scolding him, I just reminded myself that he could have just went in his pants, but rather he saved me having to wash clothes and give him a bath (although he will be getting a bath later tonight anyway). And yes, I did have a talk with him about not needing to do that in public.... or in the back yard for that matter. Earlier this evening Anna asked me to put some music on for her and Eli to dance to. Avalon's version of Great is Thy Faithfulness came on. For those of you who remember, that's Anna's song. I sat here listening to it remembering just how faithful God was to us to have given her to Mark and I. I asked her to come over here so I could give her a hug. She gave me a big ole hug, a kiss, and said "You're the best mommy ever." I said "Mommy loves you. I love you more than life itself. I'd do anything for you." Her response? "Are you crying?" Haha! I'm really enjoying this in the moment thing.